Not Like The Movies is one of 5 colours from the Katy Perry Collection released in 2011. The other colours featured in the collection are: The One That Got Away, Teenage Dream, Last Friday Night, Not Like The Movies, and a Black Shatter. Not Like The Movies is green/purple duochrome with flecks of silver micro-glitter mixed in.When I first saw this colour in the bottle my first thought was "eww". It looked like a sick frosted mint green and I couldn't imagine why anyone would buy it. I put it on and it was a complete different story. This colour is f*#^ing amazing!! Once on, this polish becomes this amazing metallic duochrome.It appears metallic purple in some light and frosted (frosted eww, I know but trust me it works!) metallic green in others. It's another fun, interesting work appropriate colour, yay OPI! The formula is another story completely. It's thin. It took 4 coats for the polish to become opaque and even then nail lines were still visible. 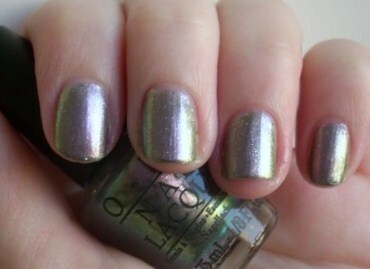 The polish dried to a lovely metallic shimmer but as the formula was streaky, brush strokes are seen in any light. The photos below show clear base coat, 4 coats of polish and 1 clear top coat.